Page 2 What Are Biofilms? Biofilm in stream in Yellowstone National Park. Biofilm scraped from reverse osmosis membrane. You may not be familiar with the term "biofilm," but you have certainly encountered biofilm on a regular basis. The plaque that forms on your teeth and causes tooth decay is one type of bacterial biofilm. The "gunk" that clogs your drains is also biofilm. If you have ever walked in a stream or river, you may have slipped on biofilm-coated rocks. Biofilm forms when bacteria adhere to surfaces in moist environments by excreting a slimy, glue-like substance. Sites for biofilm formation include all kinds of surfaces: natural materials above and below ground, metals, plastics, medical implant materials—even plant and body tissue. Wherever you find a combination of moisture, nutrients and a surface, you are likely to find biofilm. A biofilm community can be formed by a single bacterial species, but in nature biofilms almost always consist of rich mixtures of many species of bacteria, as well as fungi, algae, yeasts, protozoa, other microorganisms, debris and corrosion products. Over 500 bacterial species have been identified in typical dental plaque biofilms. Biofilms are held together by sugary molecular strands, collectively termed "extracellular polymeric substances" or "EPS." The cells produce EPS and are held together by these strands, allowing them to develop complex, three-dimensional, resilient, attached communities. Biofilms can be as thin as a few cell layers or many inches thick, depending on environmental conditions. Figure 1. 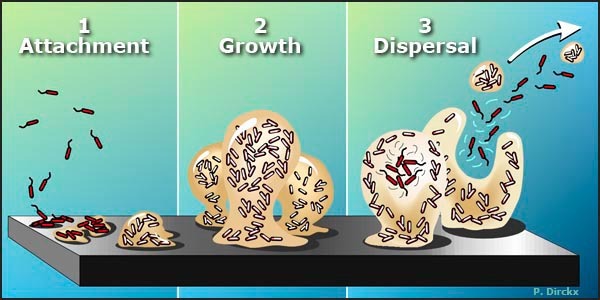 The Biofilm Life Cycle. 1. Free-floating, or planktonic, bacteria encounter a submerged surface and within minutes can become attached. They begin to produce slimy extracellular polymeric substances (EPS) and to colonize the surface. 2. EPS production allows the emerging biofilm community to develop a complex, three-dimensional structure that is influenced by a variety of environmental factors. Biofilm communities can develop within hours. 3. Biofilms can propagate through detachment of small or large clumps of cells, or by a type of "seeding dispersal" that releases individual cells. Either type of detachment allows bacteria to attach to a surface or to a biofilm downstream of the original community. In aqueous systems, microbial cells are found as both "planktonic" (floating) cells and "sessile" (attached) cells on surfaces. For generations, microbiologists studied microbial cells only in their planktonic state or grown in laboratories as single-species colonies on nutrient media. Today's antibiotics, for example, were developed by testing their efficacy on cells in suspension or grown on agar. The research of recent years has revealed, however, that bacteria preferentially attach to a variety of surfaces, and that bacterial communities exhibit properties, behaviors and survival strategies that far exceed their capabilities as individual bacteria. For instance, microbial biofilms are naturally tolerant of antibiotic doses up to 1,000 times greater than doses that kill planktonic bacteria. Aggregations of microbes were noticed long before people had the tools to study them in detail. In 1684 Anthony van Leewenhoek remarked on the vast accumulation of microorganisms in dental plaque in a report to the Royal Society of London: "The number of these animicules in the scurf of a man's teeth are so many that I believe they exceed the number of men in a kingdom." In a 1940 issue of the Journal of Bacteriology, authors H. Heukelekian and A. Heller wrote, “Surfaces enable bacteria to develop in substrates otherwise too dilute for growth. Development takes place either as bacterial slime or colonial growth attached to surfaces.” It was not until the late decades of the 20th century, however, that scientists and engineers possessed adequate technology to effectively study microbial communities and began to understand the significant implications of the biofilm mode of growth. The study of biofilms has skyrocketed in recent years due to increased awareness of the pervasiveness and impact of biofilms on natural and industrial systems, as well as human health. Biofilms cost the U.S. literally billions of dollars every year in energy losses, equipment damage, product contamination and medical infections. But biofilms also offer huge potential for bioremediating hazardous waste sites, biofiltering municipal and industrial water and wastewater, and forming biobarriers to protect soil and groundwater from contamination. The complexity of biofilm activity and behavior requires research contributions from many disciplines such as biochemistry, engineering, mathematics and microbiology. New insights into the mysteries of biofilm are being published daily in a wide variety of science and engineering journals. We welcome you to the exploration of this rapidly expanding area of study. 5 What Is Their Impact? 6 What Are Their Characteristics?